Best Dressed. I love her little shoes. Nice job Mom! Wow! what an amazingly great bunch of Londonderry kids under the age of 1! The judges had a really tough job. Everyone’s looking at the baby here, Dad! A blistering pace was set on a warm, muggy morning in the road race sponsored by David Lundgren. A very speedy but disappointed Londonderry track team member finished second, tho clearly winning on style points. The young men always have a theme – one year they ran with red capes as a Quiddich team, but this year’s Hawaiian grass skirt them was a huge hit with spectators. Congratulations to our Londonderry Lancer Track Team winner! He had also finished second to the Derry winner last year but the 2015 pace was much quicker. Crowd favorite Amy Bernard run the women’s division for the third year in a row. The 5K race goes up a very steep hill from Mack’s Apples and keeps going up and up. Here are a bunch of pictures from the road race. 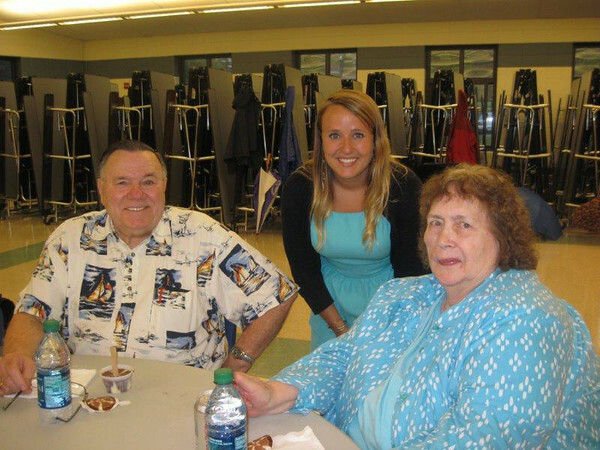 Wednesday night the senior cookout started Old Home Day off with fantastic food and music. The amazing Lions cooked up hamburgers and hot dogs with all the fixins’. There was potato salad with yummy ice cream and cookies for dessert. This was followed by a wonderful concert by the Windham Swing band. 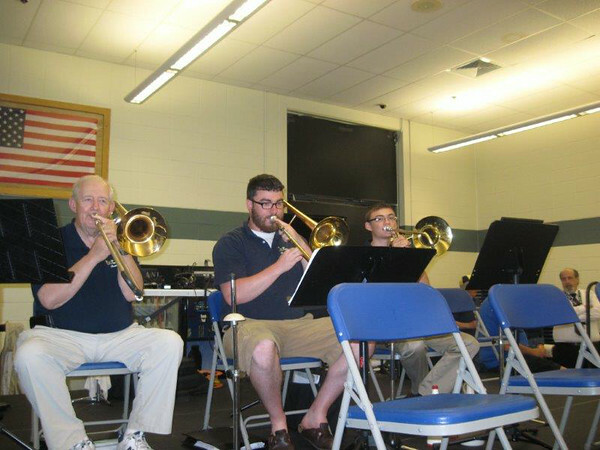 One of the trombonists revealed to this intrepid reporter that they are not all from Windham! “We’re from all over!” he said. Jack Falvey and his wife have been active in LTown for years. Last year Jack was a leader of the Save Woodmont Apple Trees (SWAT) team. Enjoy those trees on the perimeter of the Woodmont development. They will help remind of us the community’s agricultural roots. 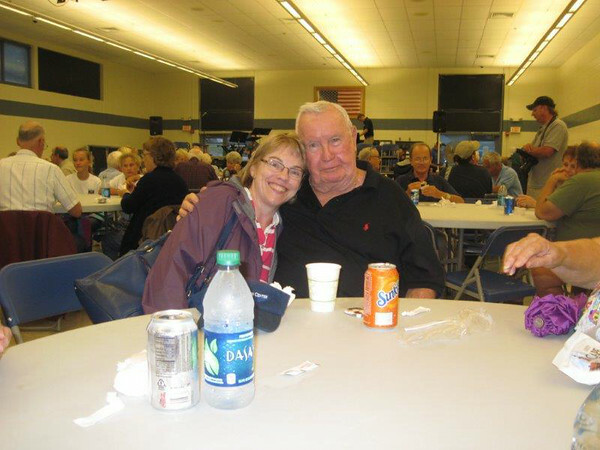 Many of the people enjoying Senior Cookout and the Windham Swing Band are the heart and soul of our community. Carole Connolly was the Grand Marshal of the OHD parade last year. Kims Bringhurst is on the Board of our wonderful Leach Library. Below, Kims Bringhust and friends are having a great time time. They’ve got a deck of cards, and ice cream and cookies are about to be delivered to them. Life doesn’t get any better! The conversation was also fantastic. “Um-yum-yum that was tasty,” these guys are all thinking. This is a great ride, with a tethered hot-air balloon, so it’s very safe. You get a view of our amazing L-Town, recently ranked the 2nd best town in NH ( Portsmouth was #1). Enjoy a fantastic view our schools, apple orchards, and Old Home Day activities: all things that make our town so special. The sky’s the limit! 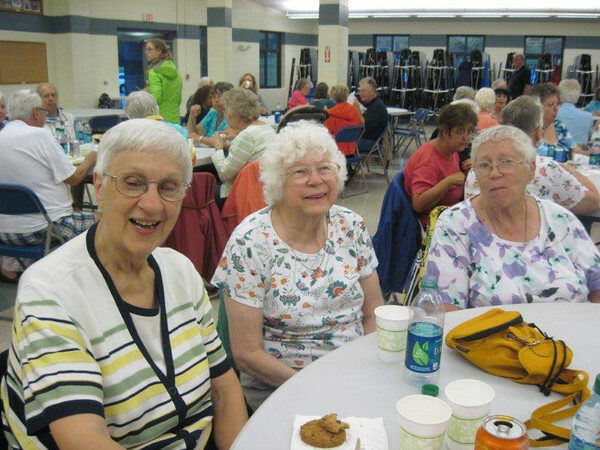 Many seniors attended the Senior Cookout, held Wednesday night in the Londonderry high school gym due to steady downpours. Dinner was followed by a wonderful concert from the Windham Swing Band. 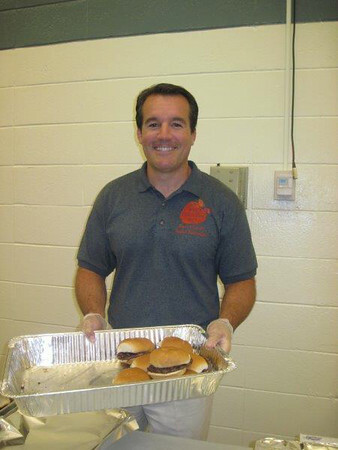 Town Manager Kevin Smith serves up hamburgers with a smile. Sharon Carson and friends serve up egg salad to hungry seniors. The Ferreiras and friend have a roaring good time. 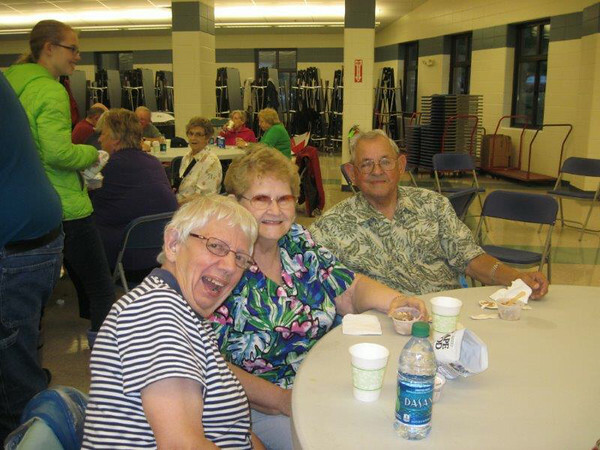 Gladys Frederick and friends enjoy the BBQ. Windham Swing Band with three (not 76) trombones warming up. Mary Tetreau and George Dolan.